Welcome to another edition of Top Ten Things, here at Enuffa.com! Continuing with the Halloween festivities, today we'll count down what are in my estimation the ten greatest vampire films of all time. Before Stephanie Meyer forever ruined the vampire genre by turning it into insipid teen melodrama involving beautiful undead emo heartthrobs (who despite not technically being alive can somehow procreate), there used to be quite a few excellent films devoted to the subject. "It is possible to create complex, thought-provoking films about vampires, exploring at what cost such powers come: isolation, loneliness, unending bloodlust, tedium, having to live with murdering people, having to evade capture and prosecution for murdering people, etc." The vampire, no matter how romantic a character you try to make him, is still at heart a repulsive, predatory creature who must kill human beings in order to survive. Think of how awful his breath must be after drinking all that blood. Imagine how filthy his clothes would be after sleeping in dirt every day. Really, are the fringe benefits of being eternally young and having superhuman strength and speed worth all the other headaches? Anywho, here's my ten picks. Oscar-winning director Kathryn Bigelow's second film was an unusual mashup of the vampire movie and the Western. Starring Bill Paxton, Lance Henriksen, and Jenette Goldstein of Aliens fame, Near Dark tells the story of a gang of vampires who live in a sun-proofed van and drift from place to place, going where the food is. One of their group, Mae, inadvertently turns a young man named Caleb into a vampire and because of her romantic attachment to him, persuades the others to accept him into their gang. Caleb spends much of the movie struggling with his transformation and trying to appease the others so they don't kill him. 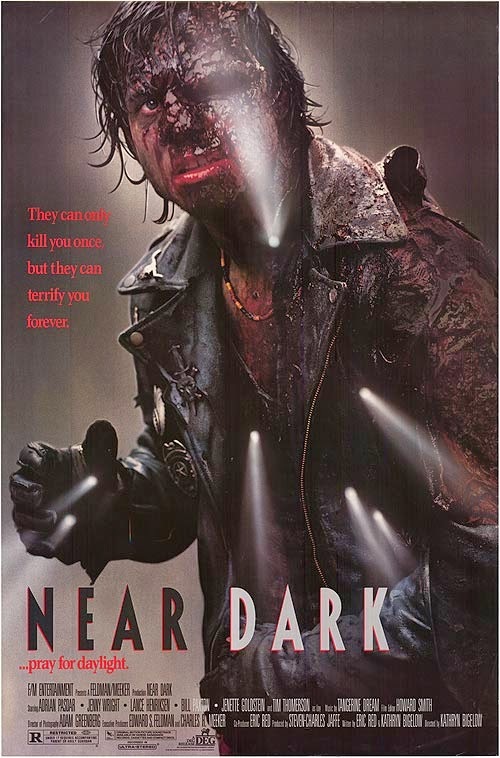 Near Dark is a very unusual and modern take on the genre, portraying the vamps as scavenging marauders not unlike the post-apocalyptic villains in the Mad Max films. They are evil but charismatic, and Bill Paxton especially shines as the brutal second-in-command Severen. With this film Bigelow showed her adeptness at eschewing the conventions of genre films and gave us an exciting new take on the vampire mythos. 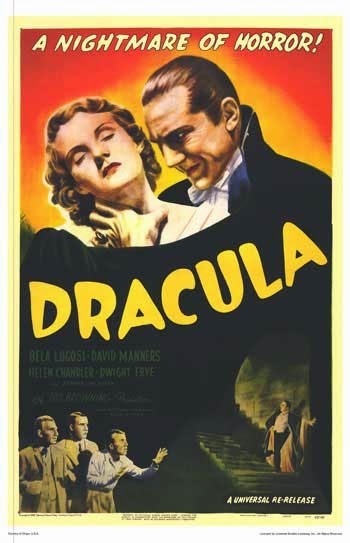 In the late 70s the well-renowned John Balderston-Hamilton Deane theater production of Dracula was revived in London and on Broadway, and its success prompted Universal Studios to remake the 1931 Bela Lugosi film for modern audiences. The result was this stylish, romantic Frank Langella version. 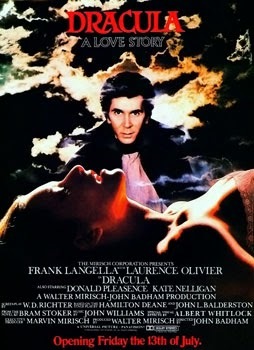 Directed by John Badham and featuring an excellent score by John Williams, this update of Dracula depicts the Count as a suave, handsome seducer, whom women willingly give their last drop. Langella is excellent as this debonair demon, imbuing the character with both smoothness and a fearsome underlying rage. The rest of the cast is also first-rate - the legendary Laurence Olivier plays Dracula's nemesis Van Helsing, Kate Nelligan is an unusually strong and independent Lucy Seward (in this version Lucy and Mina's names are oddly swapped), and Tony Haygarth is a rather degenerate incarnation of the Renfield character. This film is a triumph of production design and atmosphere, and a gritty, original take on the Lugosi version. The most famous of all vampire movies, and the one we most closely associate with the genre, Universal's 1931 adaptation of Bram Stoker's novel (via the Balderston-Deane play) launched the career of Bela Lugosi as Hollywood's premier horror star. The film seems quite stilted and tame by today's standards, but upon its release it was considered a very effective and frightening film. Lugosi gave an iconic performance, learning his lines phonetically and thus delivering them in a slightly awkward, otherworldly fashion, which only added to the strangeness of the Count. Dracula also made Dwight Frye (Renfield) famous as one of the all-time great creepy character actors; Renfield's demented laugh is still an enduring hallmark of the character. Director Tod Browning filled his cinematic palette with dark shadows, foreboding cobwebs, and beautifully lavish gothic sets. While the film's limited budget restricted much of the story to a rather tedious parlor mystery, there's no arguing that 1931's Dracula has influenced nearly every subsequent vampire film. Also check out the simultaneously-filmed Spanish version, which from a technical standpoint is actually superior to this one. Carl Dreyer's mostly silent horror masterpiece is one of the most intriguing and atmospheric films I've ever seen. 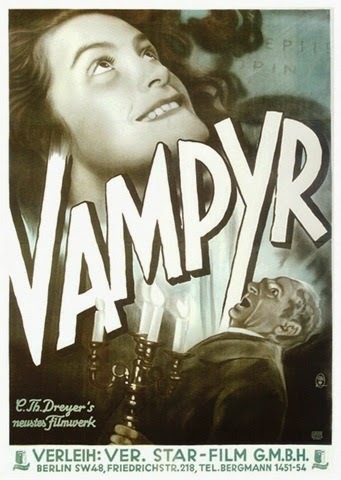 Heavily influenced by German Expressionist films of the 1920s, Vampyr contains some amazingly inventive camera tricks and a unique visual style (double exposure is used heavily, and Dreyer often filmed through a veil of gauze to create a dreamlike, diffused look). The film (based on Camilla by Sheridan Le Fanu) tells the story of a young man traveling through the French countryside who stumbles upon a mystery involving people being preyed on by some sort of monster. Falling under the vampire's spell, he is then subjected to some of the eeriest visions ever depicted on film, including ghostly shadows moving around by themselves, and most famously the protagonist watching his own burial. Vampyr is unlike any other vampire film and really evokes scenes from a nightmare that don't quite seem to fit together. At a time when Hollywood was churning out literal-minded films, Vampyr is all about mood and ambiance. Leave it to Quentin Tarantino to take a seemingly strip-mined film genre and inject it with a vigorous new energy. 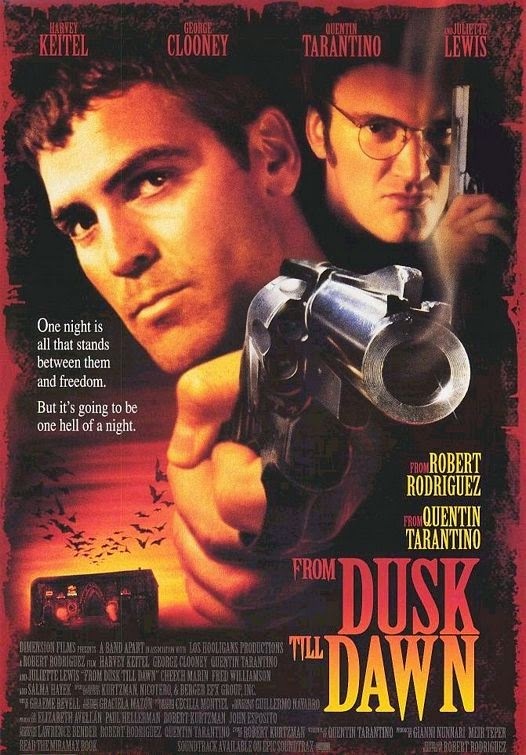 Penned by QT and directed by Robert Rodriguez, FDTD stars George Clooney and Tarantino himself as Seth and Richard Gecko, two bank robbers on the run in southern Texas attempting to cross the Mexican border. On the way they take a family hostage and commandeer their mobile home, taking refuge in a strange trucker bar that's later revealed to be a vampire lair. From Dusk Till Dawn plays like two separate films. The first half is your typical Tarantino gangster fare while the second half is an extended battle between humans and vampires, resembling Dawn of the Dead. This was Clooney's first starring role and he brings an incredibly charismatic presence to the role of Seth, seemingly relishing the character's badassery. The dialogue is typically quirky and hilarious Tarantino scripting, while the horror/action is comic-booky and over-the-top. There's not much depth to this film per se, but it's a tremendous thrill ride and I enjoyed seeing Tarantino tackle the horror genre. Neil Jordan's film adaptation of the Anne Rice bestseller is an elegant, moody character piece chronicling the life of Louis de Ponte du Lac, who at the age of 24 was attacked by a vampire and has spent the last 200 years as a creature of the night. His attacker Lestat mentors him in the ways and lifestyle of vampirism, attempting to groom him as a companion and equal. What I find fascinating about this story is that it fully explores the logistics and "rules" of being a vampire. In Anne Rice's novels for example, crosses and other consecrated objects do not repel a vampire, the stake-through-the-heart bit doesn't apply, a vampire must sleep in a coffin to avoid sunlight, and a victim becomes a vampire through a blood exchange. This was the first vamp film I'd seen that dealt with the overwhelming loneliness and guilt a vampire must have to endure. Louis eventually loses everyone he ever knew and is damned to roam the earth alone, a fate he makes it clear he wouldn't wish on anyone. 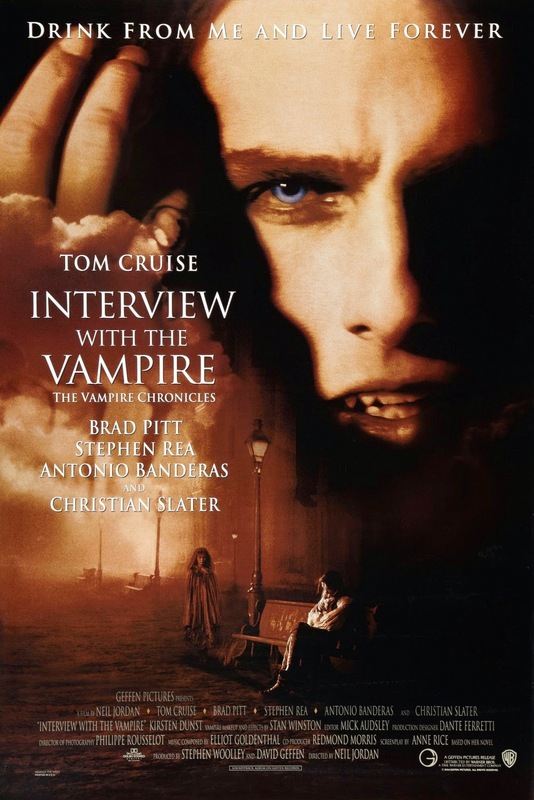 The three stars all turn in excellent performances - Brad Pitt as Louis, Tom Cruise as Lestat, and a young Kirsten Dunst as their adopted vampire daughter Claudia. Aesthetically this is a beautiful, richly-detailed film that perfectly captures the various time periods, from the late 1700s to the present day. It also makes for an enthrallingly realistic look at what would happen if vampires actually existed. Vaunted German director Werner Herzog created this labor of love as a remake/homage to the F.W. Murnau silent classic, casting longtime "frenemy" and collaborator Klaus Kinski as Count Dracula. Herzog's version of the tale is a morose, meditative film that has almost a documentary feel. The use of handheld cameras and intense light sources creates a strange contrast with the 1830s period setting, but we as the audience can't help but feel plunged into the action. Kinski plays Dracula as a desperately lonely, pitiful Count, for whom immortality has become too exhausting to bear. He seems almost ashamed of his vampirism, wearing it like a visible, open sore. This film contains dozens of haunting images - the opening montage of mummies filmed in Guanajuato, Mexico, the desolate Carpathian mountains, the ghost ship arriving in the small canals of Wismar, the army of rats that accompanies Dracula, and for me the most evocative, the "last supper" of the "infected" townspeople as they enjoy their final hours. 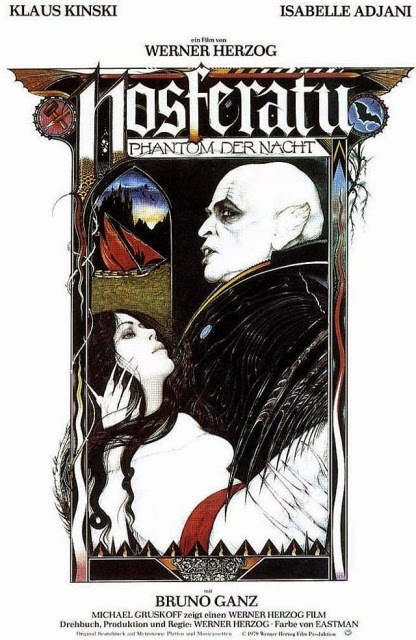 There is nothing glamorous about this version or its subject; it is a mournful film that sympathizes with the Dracula character without at all glorifying what he represents. This might be the most purely poetic interpretation of the classic story. Francis Ford Coppola's rendition of the Dracula epic might be the ballsiest one ever filmed. This version starring Gary Oldman in a scenery-devouring performance (adorned by some of the most outlandish costuming ever put to film) pulls absolutely no punches and presents the story with the volume turned all the way up. 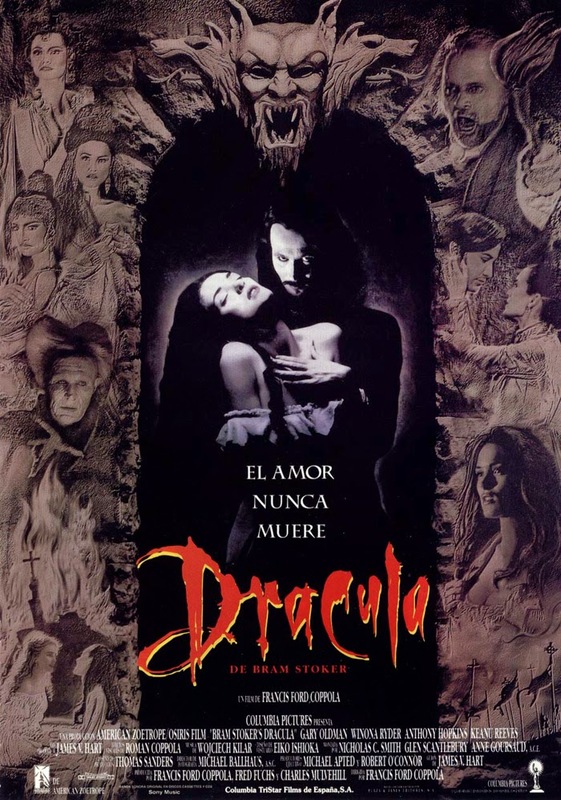 Coppola based the film's structure closely on the novel but added a central love story between Dracula and Mina Harker (played to the hilt by Winona Ryder), and ignored the book's understatedness in favor of an operatic flamboyance. This movie is a visual feast showcasing saturated colors and 1920s-era special effects. Virtually every piece of eye candy was created using the technology of the silent period, from reverse-cranked film to smoke and mirrors. The result is a splendidly unusual spectacle of cinematic decadence with an ensemble cast delivering over-the-top performances, and an unexpectedly touching romance. If the Bela Lugosi Dracula is the father of vampire movies, F.W. Murnau's Nosferatu is the grandfather. The earliest surviving film adaptation of Dracula, this film essentially created the vampire film as we know it. Using primitive effects of the German Expressionist era (visually one of my favorite styles of filmmaking), Murnau and star Max Schreck fashioned this vampire into a grotesque, disease-spreading parasite with rat-like fangs and ears, claw fingernails, and a stilted, inhuman gait. No other incarnation of the immortal Count comes as close to Stoker's vision as this one. Nosferatu brought us several iconic vampire images - Count Orlok magically throwing open doors and lurching toward the camera, disappearing through solid walls, his shadow creeping up a set of stairs, and finally his disintegration in the dawn sunlight. Nosferatu was almost lost to us when Bram Stoker's widow sued the filmmakers for copyright infringement and ordered all copies destroyed. Fortunately the movie escaped death and still holds up as an amazingly atmospheric and genuinely creepy retelling of Bram Stoker's opus. Yes this is a bit of a cheat, having a first-place tie. But the Swedish film by Tomas Alfredson and its American counterpart by Matt Reeves are so similar both in execution and quality that I consider them companion pieces. Finally a vampire film that transcends the genre and treats its subject with deadly real-world seriousness. Based on the novel by John Ajvide Lindqvist, these two films concern a socially awkward, chronically bullied 12-year-old boy (Oskar/Owen) who befriends and becomes intimately close with a young girl (Eli/Abby), who happens to be a vampire. The story closely follows both characters; Oskar has no friends and is routinely harassed and taunted by his classmates, and Eli perpetually roams about with a man who seems to be her father and whose nightly task it is to kill strangers and collect the blood for her to live on (without being caught by the authorities of course). Both kids live a desperately lonely existence as outcasts, and so they find comfort and identification in each other. Eli teaches Oskar that he needs to stand up to his bully classmates, and Oskar shows Eli how to care for and trust another person. Both versions of the film are beautifully directed and feature outstanding performances from the child actors. They are unequivocally horrific films, but at the heart of the story is this deeply touching relationship between the core characters. If you were to remove the vampire element of the story it would still work as compelling drama. This is also a story that audiences of any age can relate to. Adults will empathize with the characters' profound longing for companionship, and children will understand how difficult it is to feel at home in their own skin. 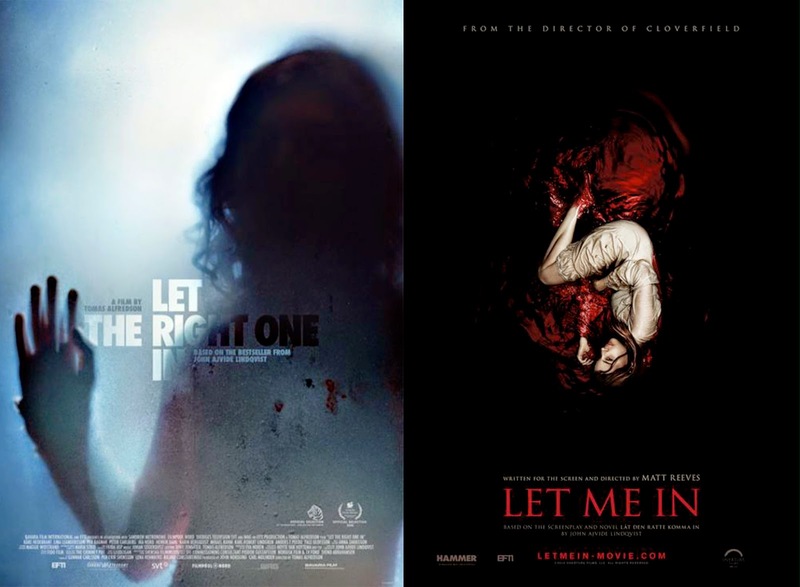 If I had to choose one version over the other I'd give a slight nod to the original Swedish one, but both Let the Right One In and Let Me In are wonderfully moving films that prove just how great a vampire story can be. Did I miss any of your favorites? 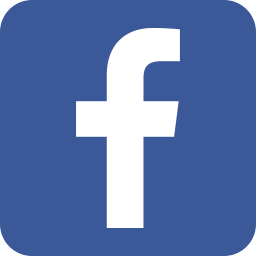 Let me know in the Comments section, and don't forget to join us on Facebook, Google+, Twitter and subscribe to our YouTube channel!